The Solar System is a vast, fascinating unknown marvel. What we do know about it is limited and contentious. Spacewalking is an app that brings the sublime and vast Solar System in GPS form to our iPhones and iPads. The app is only compatible with the iPhone 3GS, iPhone 4, and iPad WiFi + 3G. It costs $1.99 and was developed by eduweb, inc. It is hard to describe exactly what it is that this app is capable of. To begin with, you have to choose what scale you want to experience the planets on. You then pick out your starting point, which can be any of the eight planets or the sun. 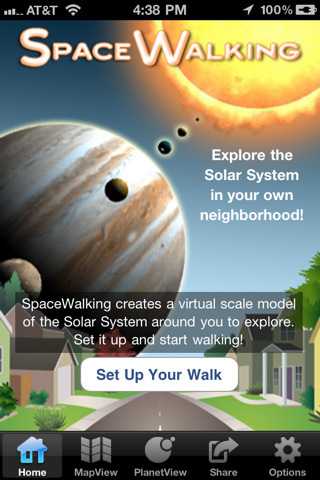 Now start walking and the Spacewalking GPS will display for you where you are in relation to the planets. 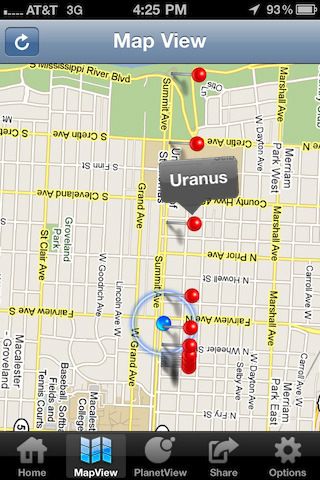 The planets show up as red dots on the GPS map and when you tap them the name is displayed. For an extra dose of galactic fun you can choose Planet View. When you are in Planet View the distance to the nearest planet is given in the bar at the top of the screen and you have the option to “visit” the planet, which means to view it up close. While visiting you get the chance to view any of the planet’s moons (if applicable). The app supplies us with the option to view the Sun, eight planets, and the asteroid and Kuiper belts. Spacewalking offers about 12 achievements its user can earn through the voyage of the Solar System. Those achievements can be found in the Options section of the app. The only problem I ran into using the app is that it was a bit difficult to understand. The issue I had was not in the design of the app but in the context. It seems that if you want to enjoy the app, you have to have some minimum understanding of our Solar System and planetary knowledge. Other than my unfamiliarity with space, which I took care of with a quick Wikipedia visit, I found the app to be interesting and amusing. It is an original and innovative concept and if you are even remotely interested in space exploration, check it out. AppSafari review of Spacewalking was written by Vanessa Paszterko on August 30th, 2010 and categorized under App Store, Education, GPS, Maps, Travel. Page viewed 8543 times, 1 so far today. Need help on using these apps? Please read the Help Page. This is incredible, it means i can go to Mass while on earth, waoooooooo, it is amazignly amazing. The features this application posesses is definietly one out of this world experience and unimaginable.